NBC’s new show Revolution hit is mid-season finale, the point where the network will air no new episodes for a number of weeks. Usually, a show returns around March after a mid-series finale but there is no telling when it will actually return. So far there have been ten episodes in the first season and, if they tighten up the plot in the second half of the season, it could shape up to be a pretty good show. Quick recap for those of you who don’t know. The story of Revolution takes place ten years after all the power in the world stopped working. Cars, trains, planes, lights and everything using power stopped working in an instant. Ten years later, the world has turned dystopian. After years of the powerless world crumbling, settlements have turned into safe zones but the rest of the world is still in turmoil. In the North Eastern United States, an oppressive force known as the Monroe Militia has risen up, lead by Sebastian “Bass” Monroe (David Lyons). Sending out one of his best men to scour the States for Ben Matheson (Tim Guinee), the man who may known why the power went out, the story begins when Captain Tom Neville (Giancarlo Esposito) arrives at Ben’s settlement. Resistance occurs from Ben’s family when Neville tries to take him. Ben is shot and Neville ends up taking Ben’s son Danny Matheson (Graham Rogers). 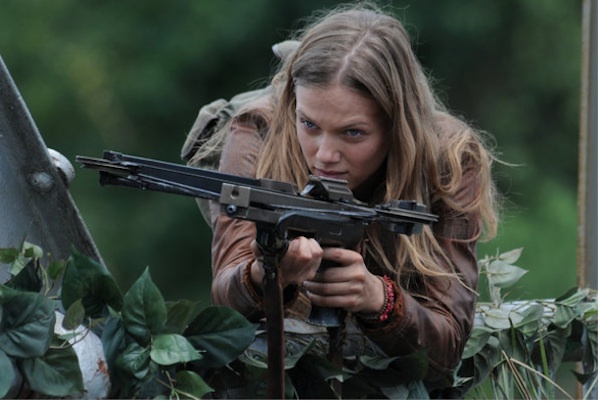 This kidnapping sets up the first half of the season as Charlie Matheson (Tracy Spiridakos), Danny’s older sister, embarks on a quest to save him. 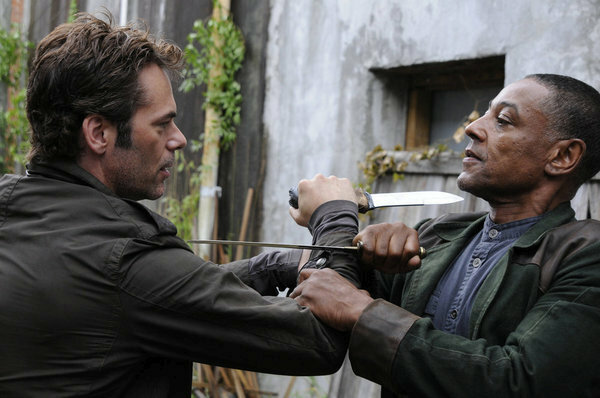 Enlisting the help of her uncle, Miles Matheson (Billy Burke), a friend of her father’s, Aaron Pittman (Zak Orth), her stepmother, Maggie Foster (Anna Lise Phillips), and resistance fighter Nora Clayton (Daniella Alonso), Charlie and her group head to Monroe’s base in Philadelphia. The mid-season finale culminates in most of the group making it to Philadelphia and confronting Monroe. The reason I began watching this show was due to one name, J.J. Abrams. As long as Abrams puts his name on a show, I will at least watch two episodes of it. As the story line continues, Revolution becomes much more than just a story about rescuing Danny. We learn that Miles used to be heavily involved in the Monroe Militia, in fact him and Monroe were best friends. Another interesting plot twist appears during the course of the show as we learn that Charlie and Danny’s mother, Rachel Matheson (Elizabeth Mitchell), is alive and being held by Monroe. Each episode drastically changes Rachel’s character development as she tries to survive Monroe without helping him turn the power back on or build a weapon. In my opinion, Revolution has left us with a lot to be hopeful for. The J.J. Abrams style running unanswered questions does appear throughout the show, leaving the audience still wondering why the power was ever turned off in the first place. We know that it has something to do with twelve pendants, each of which has the ability to power up items around it, but why and how the power turned off is still unknown. We know that both Rachel and Ben Matheson were working on a project that lead to the mass power outage. The story behind the pendants and the project involving them unravels slowly as it is referenced in flashbacks and mysterious pendant weilding members of the project begin to appear. I was hoping for a good, thought provoking cliffhanger at the end of the mid-season finale and at first I was disappointing. SPOILER ALERT After being imprisoned by Monroe, Charlie and her group finally escape with Danny and Rachel in tow. As they are running away, a project Rachel was working on for Monroe begins working, giving Monroe the ability to boost the pendants power. With this he is able to get a helicopter working and points the guns at the main characters. Now of course that’s not a good cliffhanger. We all know that the main characters aren’t going to die. The interesting part of the cliffhanger is the prospect of Monroe having power during the second half of the season. The story line so far has had a unique background but has started to get a little stale after just half a season. The idea that Monroe is the only person in the world to have power opens up the story to an endless amount of possibilities. Overall I think Revolution has a pretty good start. With a complex background to the story that gives the opportunity for even more complex growth, Revolution could very well turn into a complicated mystery thriller. The show needs to stop its villain of the week setup and start expanding its story line. There have been enough episodes to establish how bad the world has become after the blackout with enough sickeningly twisted characters to prove how bad things have gotten. I look forward to the return of Revolution with the hopes that they step it up and turn into the mind-blowing show it has the potential to be. This film is not the story of how scientology was created, I cannot stress that enough. Yes, one of the main characters, Lancaster Dodd, is based on the man who developed scientology, L. Ron Hubbard and scientology was not absent from the film. Though the word scientology was never uttered through the entire film, the principles, philosophies and ideals of scientology are used by some characters and used to influence others. While the ideas were present, at its core this film is not about scientology. It is simply about two men. If you are not familiar with the odd, didactic style with which Paul Thomas Anderson approaches his films, then this film may seem very odd to you. One of the biggest complaints I’ve heard about this film is its lack of overall conflict. I do agree that if you take the plot of this film, you won’t find conflict in a “normal” place. Though the conflict doesn’t exist in its “normal” place, I would argue that this film has more conflict than most. The film doesn’t introduce conflict as an agent to build the plot to a final climax so we can reach a satisfying ending. Conflict is introduced into the film not as a plot point but as a way to let characters grow and change on screen. Conflict drives the characters, not the plot which makes the film seem as if there is no real conflict. The main conflict that exists in the film is internal conflict and a passive aggressive conflict that exists between characters. The opening scene introduces us to the film’s insane, alcoholic main character Freddy Quell (Joaquin Phoenix). Returning from war, it becomes clear from the very beginning that Freddy is mentally unstable. Working a number of jobs while drinking heavily, we see Freddy get fired for assaulting a customer and nearly killing a coworker with a drink that he made. Moving through life in a alcohol clouded stupor, Freddy eventually stows away on a boat. The boat is transporting the members of the Dodd family to New York while the youngest Dodd, Elizabeth Dodd (Ambyr Childers), marries Clark (Rami Malek). Freddy wakes up, not remembering how he arrived on the boat, and is lead to the head of the Dodd family, Lancaster Dodd (Philip Seymour Hoffman). 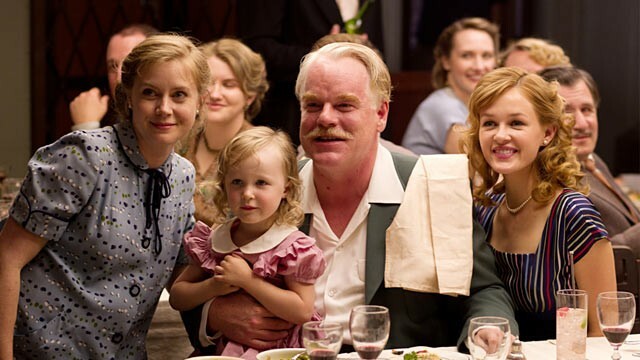 Welcomed with open arms, Freddy is asked to join the wedding and the rest of the Dodd family, Lancaster’s wife Peggy Dodd (Amy Adams) and his son Val Dodd (Jesse Plemons). Taking a personal interest in Freddy, Lancaster decides to make him a personal project which sets up the plot for the rest of the film. The rest of the film focuses on Freddy and his relationship to the Dodd family as well as the effect Lancaster’s work has on Freddy and the world. Becoming fiercely loyal in a short amount of time, Freddy becomes Lancaster’s right hand man. Submitting himself to the process that Lancaster has developed, Freddy becomes his guinea pig. The two develop a relationship while Lancaster, the Master, tries to fix Freddy with the philosophies developed through his writings and the philosophies his followers believe it. At times the relationship is volatile but it becomes clear that Freddy has a profound effect on Lancaster. As the relationship between Lancaster and Freddy grows, the rest of the Dodd family begins to distrust the man. They believe that unless Freddy gives up alchohol and changes his ways he will only bring problems to their cause. From beginning to end, this film was absolutely brilliant. 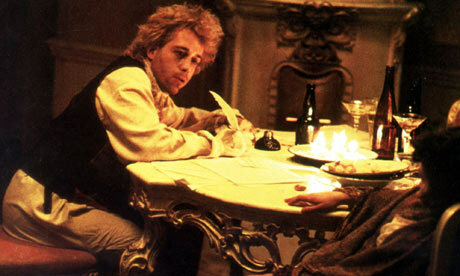 Each shot was composed beautifully, giving insight into the characters and their relationships. The film is riddled with symbols, the most prevalent being a repeated shot of churning water behind a boat. The music fits the mood perfectly, representing the possible disaster that Freddy poses, a speeding freight train that has no way of stopping as someone I know put it. 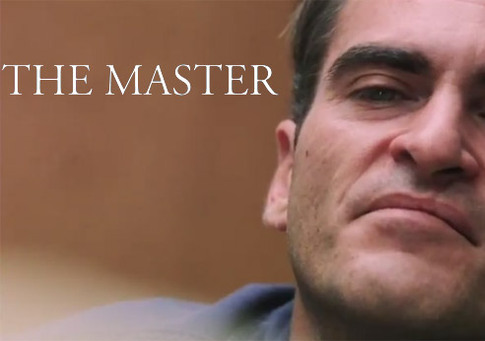 Paul Thomas Anderson proves time and time again his overwhelming skill with a camera. The only thing more impressive than the directing in this film was the acting. I am still trying to decide if I have very a more perfectly acted film. 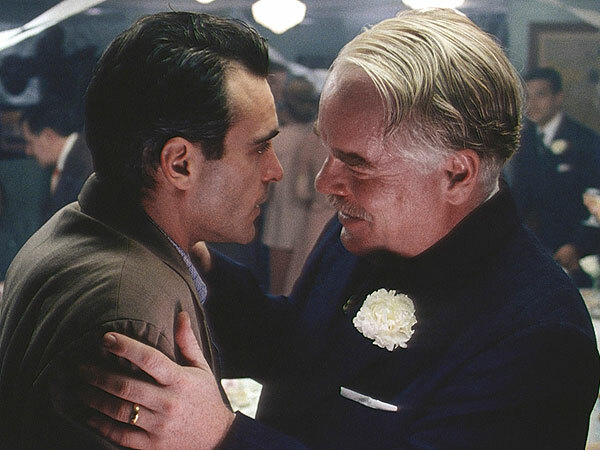 Both Philip Seymour Hoffman and Joaquin Phoenix gave performances that made my jaw drop and left me completely speechless. On their own, each actor gave an Oscar worthy performance but when they were on screen together, somehow their performances got even better. There was a single scene, a scene where Lancaster gave Freddy his first round of processing, that I can honestly say is the greatest acted scene I have ever have the fortune of viewing in theaters. 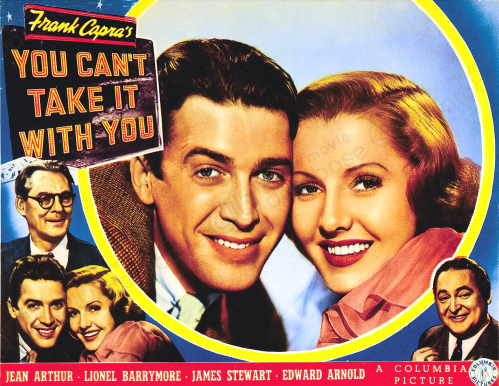 While the two main characters gave the acting performances of their lives, the rest of the acting in the film was superb as well. Though Amy Adams didn’t have as large of a role as I wanted, she commanded the screen every time she graced it, bringing a forceful beauty to the film. I have not seen enough movies with Oscar buzz to definitively say that the Master will win best director, best picture and best actor, I can at least predict some nominations. The film will be nominated for best picture and I’m fairly certain that Paul Thomas Anderson will pull in a nomination for best director. If both of them can’t be nominated, at least one of the two lead actors will be nominated for best actor even though as far as I’m concerned, they should split this year’s Oscar in half and give it to both of them. Amy Adams has a chance to be nominated for best supporting actress but her role may not be large enough to give her the nomination. Overall, I can easily say this is the best film I have seen all year. I give the Master a 9.5 out of 10 and, while it may not be for everybody, recommend it to anybody that wants to see a tremendously well-done film. I’m still not quite sure how I feel about the direction this week’s episode of Doctor Who took and when I say direction I mean both the plot of the show and the literal directing. As we get closer and closer to Amy Pond and Rory Williams’s departure from the show, the episodes have been taking a closer look at them. We have often been given small scenes portraying Amy and Rory’s life without the Doctor but this week’s episode, the Power of Three, focused on the life Amy and Rory are creating together. This entire episode was specifically crafted to show that Amy (Karen Gillan) and Rory (Arthur Darvill) are beginning build a life for themselves that doesn’t revolve around the Doctor (Matt Smith). Amy has begun writing for a magazine and Rory has been asked to work at the hospital full time. We learned quickly that the time between the Doctor’s visits to Earth have grown in length which has given Rory and Amy time to start a life. At one point Amy even asks “did real life just start?” The two have not just considered but actually started a life without the Doctor. Though it has been months since his last visit, the episode begins with an event that demands a visit from the Doctor. One night, hundreds of thousands of small, identical black cubes appeared all over Earth. With the cubs posing no immediate threat, the Doctor determines the only course of action is to observe the cubes until they do something. After four days of observation the Doctor gets antsy. Begrudgingly offering to observe the cubes, Amy releases the Doctor to travel the universe while she and Rory stay on Earth. 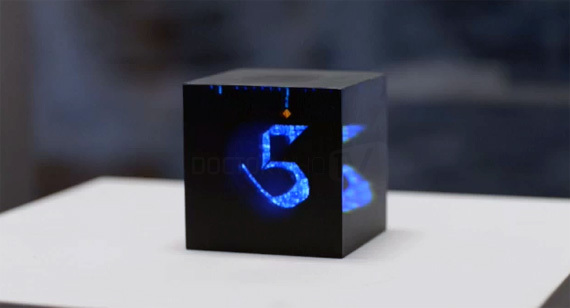 The cubes remained inactive for almost a year and even before they active (which we all knew they were going to do) the Doctor visits Earth for Amy and Rory’s wedding anniversary. It is then that the Doctor begins to realize that he and his companions are moving in different directions. Choosing to deal with his hatred of boredom, the Doctor decides that he misses Amy and Rory and rather than dragging them off to dangerous adventures in space he stays with them at their house. After about a week of the Doctor being there, the cubes finally activate. The cubes, which have now been dispersed all over the world, scan the entirety of the human race before attacking. The Doctor finds out that the cubes were sent by a race of aliens called the Shakri, a mythological race from the Doctor’s old bad time stories. Dead set on exterminating the human problem, the Shakri are attacking and as always, the Doctor stops them. Earlier I mentioned that the way this episode was directed bothered me and it only bothered me for one specific reason. If I had to pick one word to describe this episode it would be scatterbrained. This episode covered multiple years yet Amy and Rory didn’t seem to age a day. 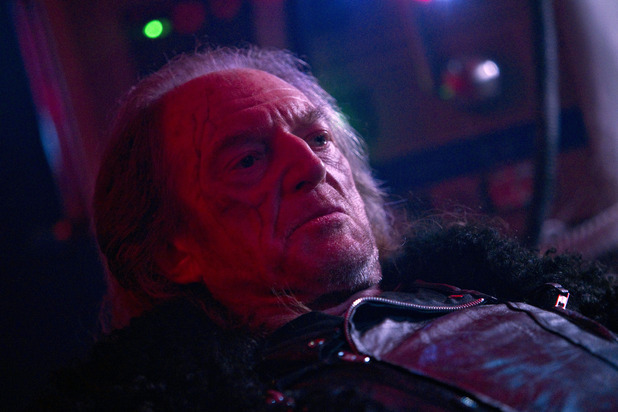 The explanation of the villain was rushed and didn’t really make sense though they made it seem as if the villain was an important figure in the Doctor’s folklore. 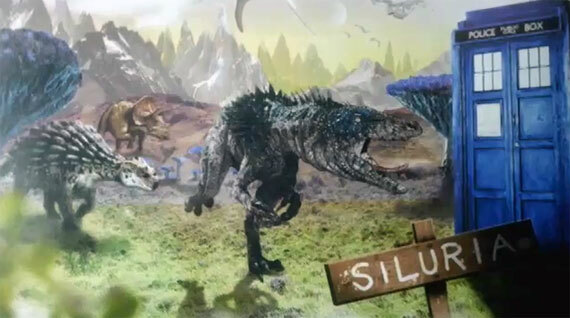 I am hoping that the introduction of this group of villains, the Shakri, was simply foreshadowing their return as a major villain later in the season or series. Overall I did like this episode but it was no the most coherent and cohesive episode of this season. While I fought faults and flaws in this episode, the overall message comes through crystal clear. The Doctor and the Ponds are growing apart. Life is going on and changing around all three of them but it is directing them to different paths. The question arises in the episode, do the Ponds travel with the Doctor because they are running away from their real lives or if the Doctor keeps running back to the Ponds to keep them from fading out of his life. Both parties realize that the end of their time together is coming. The Ponds are just about ready to begin their own lives, their own normal lives as a married couple living on Earth. For the Doctor, a normal life is what he does, travelling around in the TARDIS and seeing everything the ever expanding, ever changing universe has to offer. They are moving in different directions and eventually, they will have to travel together for the last time. Next week’s episode features the return of one of the Doctor’s most infamous villains, The Weeping Angels. The episode will be called The Angels Take Manhattan but the episode will feature far more important aspects than just the return of the Weeping Angels. The fall, mid-season finale, this episode will feature the final goodbye between the Doctor and Ponds. I am not a Shia LeBeouf fan. I’ll come right out and say it. The last role I liked him in was Even Stevens, other than that he has pretty much been ruining movies for me with the exception of Holes. He was watchable in Transformers but let’s face it, it doesn’t take much skill to run around and yelled “BUMBLEBEE.” As much as I dislike Shia LeBeouf, I love Tom Hardy. There hasn’t been a single role I have disliked Tom Hardy in. When I saw the first commercial for Lawless I was torn. I did not want to go see a film with Shia LeBeouf but I did not want to miss a film with Tom Hardy in it. Eventually, my love for Tom Hardy overcame my aversion to Shia LeBeouf. I saw Laweless in theaters and I am extremely glad I did. Lawless tells the story of the Bondurant brothers, famous Prohibition bootleggers from Franklin County, Virginia. Selling their moonshine to civilians and police officers alike, the brothers play by their own rules and ignore everything else. They are lawless. The operation is run by the quiet, eldest brother, Forrest Bondurant (Ton Hardy). Legend has it that Forrest is invincible, something he proves multiple times throughout the course of the film. A quiet but violent man who always has a set of brass knuckles handy, Forrest only shows his soft side when around Maggie Beauford (Jessica Chastain). A city girl hired to work at the brothers gas station, Forrest and Maggie eventually foster a romantic relationship. Drunken and angry, the middle Bondurant, Howard (Jason Clarke), acts as the operations muscle. When angry, Forrest attacks enemies with fierce violence but for day to day issues, like lookout jobs, backup or dealing with the law trying to shake them down, Forrest leaves the muscle work to Howard. The final and youngest Bondurant who serves as the main character for the film is Jack Bondurant (Shia LeBeouf). As Officer Charlie Rakes eventually says, Jack is the runt of the Bondurant litter. A young man who desperately wants to be a part of the family operation, Jack is given and takes as many chances as he can to help out his brothers. It becomes clear that Jack is not a fighter like his brothers are after a number of scenes were Jack is taken advantage of and often times brutally beaten. As Jack is allowed to participate in the business, he starts to think to highly and eventually puts himself, the woman he is courting, Bertha Minnix (Mia Wasikowska), his best friends that acts as his right hand man, Cricket Pate (Dane DeHaan) and the entire operation in danger. Experience, anger and a personal assault on Cricket eventually ends up teaching Jack how to be a Bondurant and he steps up in the end of the film to try and save his reputation. Though there are many characters, twists and turns, the plot of the film can be stripped down to some simple components. The films villain, Officer Charlie Rakes (Guy Pearce), is a special detective brought in front Chicago to end the bootlegging fiasco in the wettest county in America, Franklin County. Targeting every bootlegger in the county, including the Bondurants, Rakes goes to extreme lengths to destroy them. Attacking them from every angle, Rakes basically goes to war with the brothers, a war the Bondurants are happy to participate in. Each side takes shots at the other, fight with guns, knives, brass knuckles and fists, eventually coming to a final showdown one a bridge leading out of the County. My only disappointment with this film was the fact that Gary Oldman was only in it for about five minutes. Playing Chicago gangster Floyd Banner, Jack and Cricket are obsessed with Oldman’s character and eventually end up selling him their moonshine. Every moment he is onscreen, Oldman is brilliant (as he always is) but the film’s advertisements suggested that Oldman had a large role in the film which was not the case. I found this to be very disappointing. Other than a lack of Oldman, I can’t find much wrong with this film. Tom Hardy, though he plays a quiet character, gives one of my favorite roles of his career, breaking up his angry violent spells with moments of dry humor. Guy Pearce bring to life a villain with such brilliance that I hope a Best Supporting Actor nomination is in his future. Mia Wasikowska and Jessica Chastain are both stunning and hold their own amongst the angry men, bringing notes of delicacy to the rough and tough film. Even Shia LeBeouf, who I expected to dislike in the film, did a good job. He portrayed Jack in the perfect light, allowing the audience to watch him grow up and stand up for himself by the end of the film. Filled with beautiful scenery this film was an all around winner. Director John Hillcoat and writer Nick Cave made sure that the film wasn’t just about the fighting and violence, giving characters depth and playing with light and shadow at perfect times. As far as me liking the film and being entertained by it, Lawless gets a 5 out of 5. Looking at it being a good film, considering shot composition, directing, acting and writing I give this film a 4 out of 5, giving an overall 9 out of 10. The violence at times does get gratuitous and intense but if you can handle it, this film is a must see.